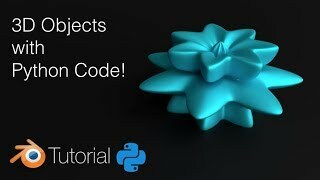 In this tutorial I will teach you how to create 3D objects with Python is the free 3D software Blender! Is it a certain program you use to display the keys and mouse actions on screen? I was in 3dsmax at that time wondering how to make those animated objects. I still do in Blender. And what an motivating introduction to Python it’d be! I remember firs trying Blender and the UI scared me, what are all this buttons for?, how do I even edit this cube?, how to I turn this cube into a Katana?, few months later I modeled my first Katana. But I was still afraid of Cycles, how do you even arrange those nodes? that do they even mean?, few months later and a lot of tutorials (including yours) and and I was in awe at the possibilities, how did I lived without Cycles?. But I was still afraid of the compositor. I never used the compositor before, then I give it a try and omg the possibilities, how did I even lived without using the compositor?. But I’m still afraid of the python scripts, so many variables… time to watch some tutorials.